In September, 2008, Ancestry.com conducted two 46-marker y-chromosome tests: one for Harry Dale Cline, a direct male descendant of Peter Cline through his son Michael; and a second test for Larry W. Cline, a direct male descendant of William Cline (Johnson), later confirmed to be a son of Michael Cline. The results were remarkable. Of the 46 markers, Harry Dale Cline and Larry W. Cline matched 45. The mismatched marker was off by only one number, indicating a very recent mutation. Ancestry.com computed their Most Recent Common Ancestor (MRCA) as within five generations. In other words, Harry Dale Cline's and Larry W. Cline's ggg or gg grandfather is the same man. Wythe County, Virginia Clines - Nicholas Cline: DNA tests confirm that Peter Cline and Nicholas Cline are not related. Note - there has been much confusion and misinformation about the relationship of Nicholas Cline and Peter Cline of the Tug. DNA tests confirm that these two men were not related at all. See the page (above) on this family with further detail on the DNA and other evidence which proves conclusively that they are not related. 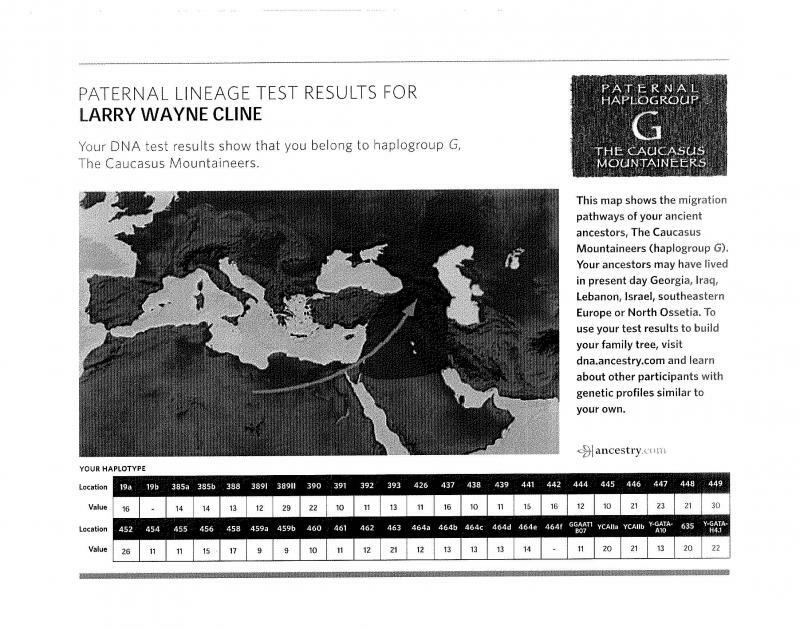 Ohio River Clines [Monroe County, Ohio] (WV/OH) - Hans George Cline: Although they are also Haplogroup G, it appears that our Peter Cline is not closely related to these Clines. These Clines are related to the Clines of North Carolina (see below). The Ohio Clines and North Carolina Clines trace their ancestry back to a Pieter Klein (1575-1635) of Alsace, Germany. See the website: http://www.ncgenweb.us/catawba/Cline/index.htm for more information on the descendants of this Pieter Klein. North Carolina Clines - Sebastian Cline/Moritz Cline: As with Hans George Cline, above, although this family is also haplogroup G, it appears that Peter Cline is also not closely related to these Clines. This group is, however, closely related to the Ohio River Clines as they also descend from Pieter Klein (1575-1635) of Alsace, Germany. The first number/letter is the genetic marker tested; the number after the dash is the allele value which is specific to the person being tested. For example, the first marker, "19a" has an allele value of "16." The more allele numbers you match with another person, the more closely related you are. Larry W. Cline's and H. Dale Cline's allele numbers matched exactly except marker 446. At 446, Larry W. Cline has a value of 21; H. Dale Cline has a value of 20. This indicates a very recent mutation.